As a research and programming unit, our charge at CSREA is two-fold. First, to support scholarly research among faculty and advanced students and to extend research networks for scholars on campus and beyond. Second, to host academics and artists as well as pundits and critical thinkers external to Brown who address not only timely and cutting edge research topics, but also persistent and pressing issues regarding race and ethnicity in society. An on-going informal workshop/seminar series to which faculty and graduate students are invited to present and discuss recently published work and work in progress. Series of academic lectures and workshops designed to undertake an extended campuswide examination of structural racism in the United States — its origins and manifestations. Designed to create intellectual community and deeper cross-generational/cross-rank mentorship and dialogue among a small group of advanced graduate students, postdoctoral fellows, and faculty working on race and ethnicity. Series to support graduate student research on race and ethnicity, build research community across disciplines, and support our graduate student professional development. Features scholars presenting talks on new books, followed by an advanced seminar on their research process, methodology and other research related themes that emerged while developing the book. Accomplished scientists and engineers discuss their pathways to success, common challenges faced by women and historically underrepresented groups in STEM fields, and the strategies they've developed for overcoming these obstacles. CSREA Faculty Grants are designed to support the synergistic development of intellectual community and research on campus by funding and staffing campus-based events or supporting research focused working groups. If you would like us to consider your scholarly program/event for co-sponsorship, please complete the co-sponsorship request form. We will be in touch with a decision within 1 - 2 weeks. 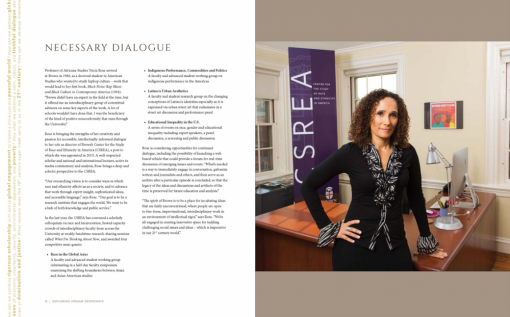 Making a dynamic space for thoughtful and timely discourse about race and ethnicity.